As a child, life centers around fun. As an adult, sometimes you need to make a conscious effort to find fun: girls night, date night, “me time.” Some days, you take what you can get. Today is one of those days, so here I am writing about the kitschy items in my kitchen, the little things that make me chuckle on a daily basis. 1. 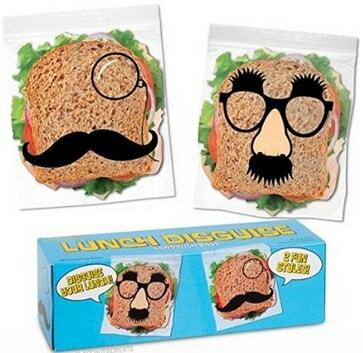 Lunch Disguise Sandwich Bags: Sure, I know it’s not the most environmentally friendly option, but don’t you wish your mom packed your lunches in these bags back in the day?